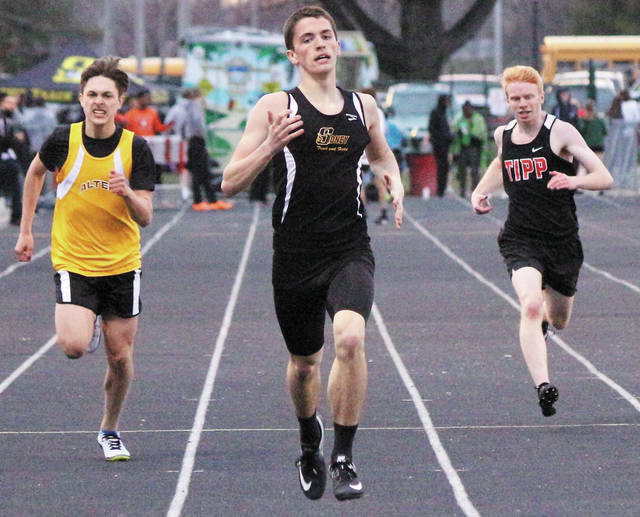 Sidney sophomore Curtis Spangler runs during the 400 meter dash during the Herb Hartman Invitational on Friday at Troy Memorial Stadium. 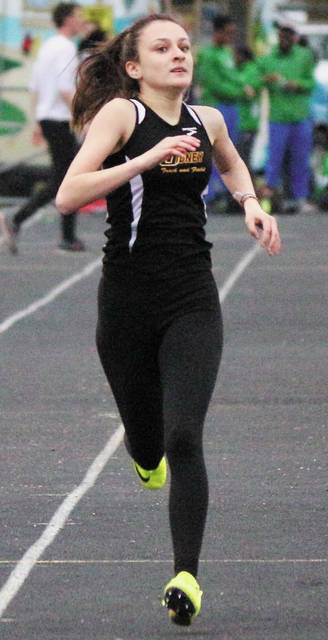 Sidney freshman Maya Thompson runs in the 400 meter dash during the Herb Hartman Invitational on Friday at Troy Memorial Stadium. 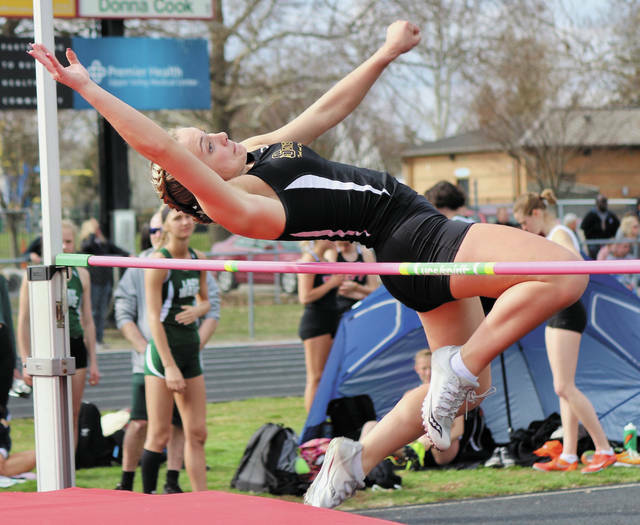 Sidney junior Ava Parin competes in high jump during the Herb Hartman Invitational on Friday at Troy Memorial Stadium. Parin finished ninth after clearing 4-6. Sidney senior Gavin Bockrath runs in the 1,600 meter run during the Herb Hartman Invitational on Friday at Troy Memorial Stadium. Bockrath finished seventh in 4:51. 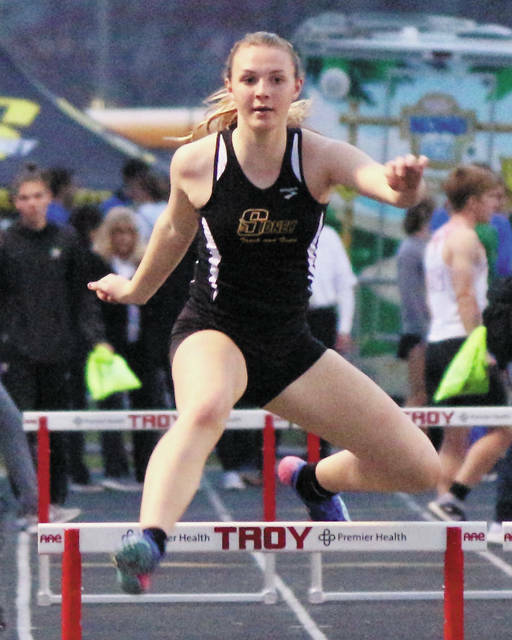 Sidney freshman Cassidy Truesdale competes in the 300 meter hurdles during the Herb Hartman Invitational on Friday at Troy Memorial Stadium. 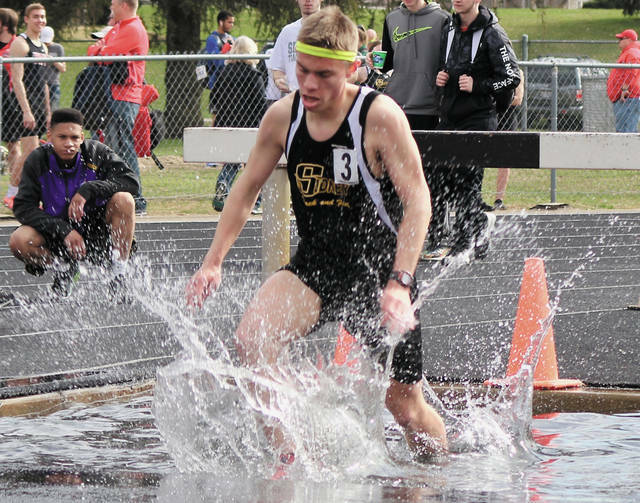 Sidney junior Noah Schwepe competes in the steeplechase during the Herb Hartman Invitational on Friday at Troy Memorial Stadium. Sidney senior Josiah Hudgins competes in high jump during the Herb Hartman Invitational on Friday at Troy Memorial Stadium. Hudgins finished first by clearing 6-4. TROY — When it comes to the high jump, mental toughness is just as important as physical talent. After all, nearly every competitor ends their day with the failure of a missed attempt. But on Friday, Sidney High School senior Josiah Hudgins walked away from the high jump on his own terms. Hudgins won the event at the Herb Hartman Invitational at Troy’s Memorial Stadium, leaping 6-feet, 4-inches to tie his personal best. Instead of going for 6-5 – or the school record of 6-6 – Hudgins decided to save his energy for his other events. Hudgins is chasing the high jump and long jump school records that have survived for more than 35 years. The high jump record is 6-6 and the long jump record is 22-5. Hudgins personal best in the long jump is 21-0. Hudgins didn’t participate in the long jump Friday. He did finish ninth in the 100-meter dash in 11.55. That ended up being Tiffin University. Hudgins will play football for the Dragons, but he broke into a wide grin when asked if the track team was trying to land his services, too. The Tiffin men’s track team is currently ranked No. 17 in the nation in the NCAA Division II poll. Last month the Dragons finished third in the nation at the D-II indoor championships. On Friday, Hudgins was battling a trio of competitors trying to clear 6-3. Carroll senior Aaron Cooper, Springboro senior Roderick Flint and Wayne junior Brendan Hill all joined Hudgins at successfully getting over 6-0. Hudgins was the only jumper to get over 6-3. Soon after he tied his personal best. 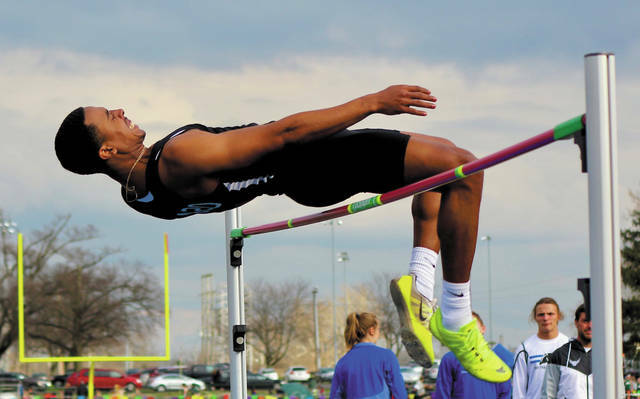 “He’s a really good competitor,” Sidney high jump coach Evan Baker said. “He had a couple misses but he came back on his third jump two heights in a row to get it. He’s quite an athlete. Hudgins’ goals by season’s end are 6-7 in the high jump and at least 23-0 in the long jump. His leap Friday also established Hudgins as a favorite to win the Greater Western Ohio Conference meet, though that’s still a ways off. “Last year he really started to own it,” Baker said. “Both the high jump and long jump started clicking. Once he realized he could that confidence factor kicked in. Sophomore Curtis Spangler also competed in the high jump and finished eighth (5-09). Among other highlights Friday, senior Emma Wiford won the discus with an effort of 102-02 and finished second in the shot put with 34-01.5. 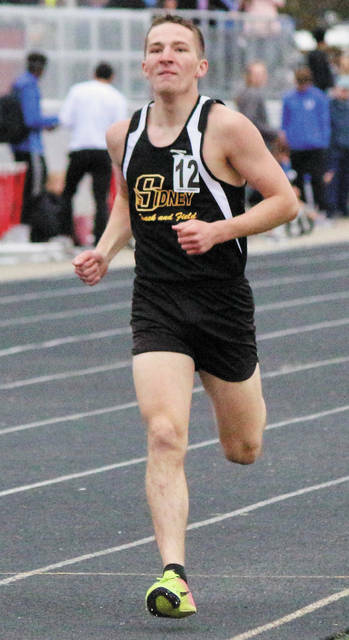 Additional top-10 finishers included from Sidney senior Gavin Bockrath in the 800 (6th, 2:06.04) and 1,600 (7th, 4:51.68); sophomore Braden Guinther (5th, 11-6) and sophomore Ian Watterson (7th, 11-6) in the pole vault; junior Ava Parin in the girls high jump (9th, 4-6); the boys 400 relay team (4th, 44.90), boys 1,600 relay (9th, 3:44.34) and the girls 400 relay (9th, 55.38).